Today has been a particularly bone-chilling, dreary, damp, windy, rainy day with temperature steadily dropping this afternoon; looking out the windows you see puddles of water everywhere and you can’t really walk anywhere without getting wet feet; this calls for something filling, flavorful, and warm for supper. (I also need to “tidy up” the freezer to get rid of some of the partial packages of this and that which have accumulated from single-serving cooking.) Since I’m really fond of charcuterie, that seemed like a good starting point for comfort food tonight. I found Sicilian sausages (house-made) at Harris Teeter when I went shopping yesterday (in 70°F weather, but knowing the forecast) so I got some sausages for a one-pot meal. 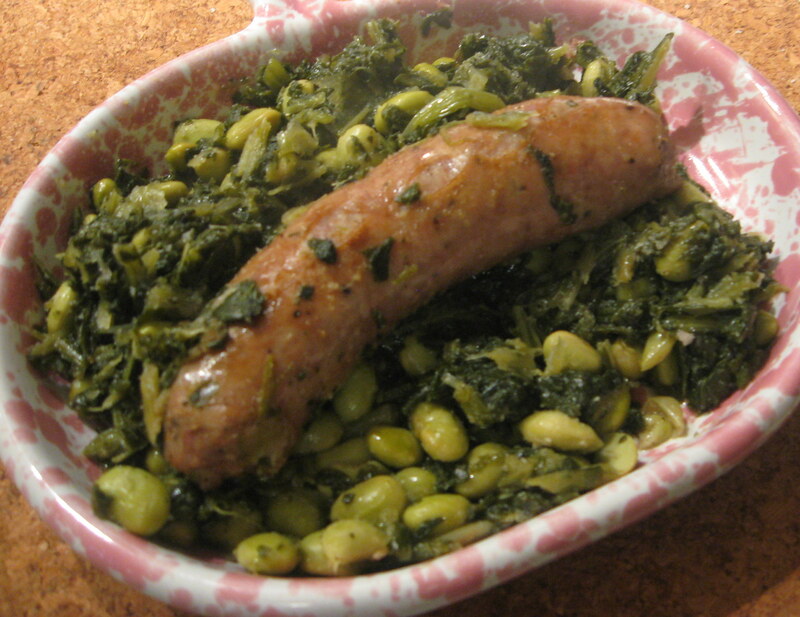 Part of tidying up the freezer involves using the bits and pieces living in there, so I thought I’d improvise on one of my favorite meals: braised green, sausages, and beans. The Sicilian sausages are similar to spicy (not raging hot) Italian with orange zest added so it does well with any rather mellow greens, like turnip, or kale. I was pretty confident that I had greens of some ilk in the freezer, beans, onions and the like as well; all I needed for my supper was the sausages. What I found in the freezer to go with my sausages were turnip greens and edamame (soybeans). I browned the sausages in olive oil, added onions, some garlic, the turnip greens, and edamame and a bit of water. After reaching a simmer on the stove-top I popped the covered pot into the oven at 425°F oven and went back to the computer to keep working. After about half an hour in the oven, I uncovered the pot for about 15 minutes to let a little more liquid cook off and supper was ready! I usually use two sausages to make this–one is quite adequate for a single serving. I like to put the “leftover” in the freezer for a quick meal later as this freezes and reheats well. There are lots of easy variations on this dish–use other types of beans like cannelinni, borletti, or pinto–or potatoes to fill this out. Vary the greens–if you have a sweeter sausage, then mustard greens make a great contrast with their sharp, slightly hot flavor. This can be turned into soup really easily too: slice the sausage, add some broth, add some pasta, and a whole new meal. There are so many delicious sausages out there and an almost infinite variety of greens to pair them with. You don’t need exact measurements here at all so it does well for single-serving meals. Just cruise through the produce department and eyeball the greens: frisée, dandelion, kale, mustard… Bitter greens pair well with sweeter sausages like lamb or sweet Italian–have fun, improvise and a son goût! Wine? of course! This just needs a good “everyday” red–even something out of a box, like the Portuguese Alandra box red. We are, after all, talking peasant comfort food here. Now that is hearty and comforting food to me. None of that mac and cheese stuff! And it’s pretty, too! Thanks. It’s also very easy! This is one of my favorites, though at time mac and cheese is needed–it’s a bit like a grilled cheese sandwich and tomato soup.